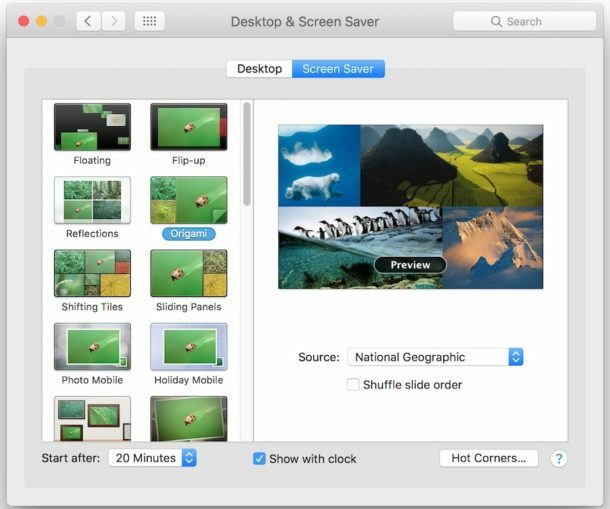 The Mac has two general directories where screen savers are stored, one at the user level and for each user account, and one at the system level which stores all the default screen savers included on a Mac. Knowing where the screen saver directories are located can be useful for various reasons, whether for installing a screen saver, removing one, editing one of the files with Quartz Composer, or various other purposes, so we’ll quickly show you where you can find the screen saver folders on a Mac. The system level screen saver folder is located in the /System/ folder and any screen saver located in the directory will be included on all other user accounts on the Mac. This is also where the default screen savers are located in Mac OS, for example the Flurry or Floating Message screen savers. An easy way to access that folder is with the incredibly useful Command-Shift-G keyboard shortcut in the Mac Finder, which lets you instantly jump to any directory on a Mac if you know the path. This applies to all versions of Mac OS and Mac OS X. That particular directory typically only contains the “Defaults Collection” folder which is a series of visually pleasing images, and unless a user modified the directory it usually does not contain any .qtz or screen saver files. The /Library/ folder also contains the default desktop pictures on a Mac as well as various other media and components that are used by all user accounts on a particular Mac. Note the system screen saver folders are different from the user level screen saver folder(s). Remember, the tilde ~ is just shorthand for the current users home directory. If you plan on manually installing a screen saver in Mac OS, for example if you wanted to use the stunning Apple TV screen savers, you’d want to place the screen saver files into the user screen saver folder. And so now you know where the three default screen saver folders are located in macOS and Mac OS X. Unless you know exactly what you’re doing and why, you probably don’t want to remove any of those default screen saver files, as it’s best to leave any system level folder alone so you don’t mess anything up. If you enjoyed this, you might appreciate this neat trick turning a screen saver into your Mac desktop background picture, or browsing through some more Screen Saver articles here. I make an album in Photos called Desktop & Sceensavers. Works fo me! I always remove (but save somewhere) the Apple-supplied images, then replace them with those I’ve created and used for years … even when I worked for a company which thought “Windows” was another word for “computer”.